Your Conundrum: How do I deploy my Sinatra App to a Shared Hosting service like GoDaddy, Hostpapa, Funio or HostGator? So, you've got yourself a Shared Hosting provider because, like me, you like cheap. However, like the rest of the world, you've ended your turmoil-filled and messy relationship with PHP and found Ruby. You realized that deploying your new Ruby app is not as easy as FTPing those shiny-looking rb files to your hosting account. You've learned that cloud hosting with the big guys is not cheap, and utterly unnecessary for your Personal HomePage. You've become depressed and now roam sketchy CKAN and Reddit channels at night, or secretly stalk PHP threads in StackOverflow in search of self reconciliation. Fear not, there is a way my friend, there always is. What you see might not be exactly the same as different providers have different versions of CPANEL installed. 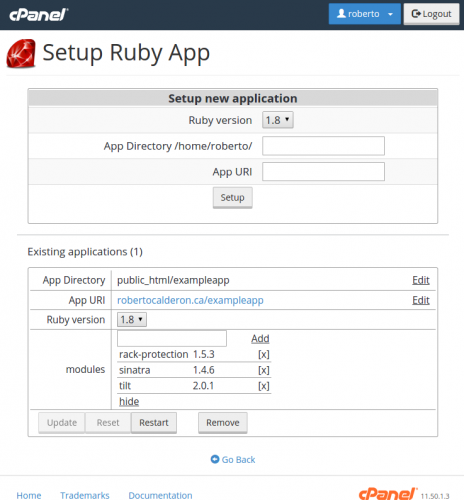 What's important is that you can select a version of Ruby. That means our item number (1) is done. Configure the App Directory to point to a location where we will save our files. Configure the App URI where you want people to access that app, in my case it was "exampleapp". Chances are you don't need to modify anything here, as this file was created by the Setup Tool from CPANEL. One more step is needed though. We need to install the needed modules for our application. If you were keen in the last step you might have visited the URL to find an error. That error arises because Ruby can't find the files to import sinatra. So let's install this module (library). You do that in CPANEL, under modules. Start typing (or select from available modules) "sinatra" and install the version you need (for this example the latest would probably work). If your app needs more modules it is time to get all those done here. Click on "update" and "restart" to restart your application. If you run into troubles or think I missed something just drop me a message below. Cheers!